The inclusion of an R&D Technology Maintenance Bypass Switch (MBS) is recommended in all critical power applications and is a means of reducing the downtime in the unlikely event of a UPS failure. The MBS allows for the removal, maintenance or repair of the UPS without disruption to the critical load equipment. No downtime. Routine maintenance can be performed during normal hours by simply switching the MBS to the “Bypass” position. The load is then fed directly from mains power while maintenance is safely performed on the UPS. 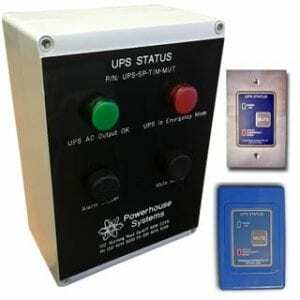 UPS can be completely removed from the circuit simply by switching the MBS to the “Bypass & Isolate” position. The load is then fed directly from mains power and at the same time there is no voltage present at the UPS inputs or outputs so it is safe to work on. Padlocked option available on request. Note: All MBS’s can be customised for specifi c customer requirements and specifications.